I finally got this sweet little ring finished. I almost wish it fit me. But I guess I am glad it doesn't so I am not tempted to keep it. 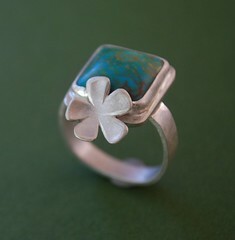 I named it Turquoise Ring adorned with a sweet flower. I really love the square turquoise cabochon. It has beautiful colors in it. The ring is inspired by flowers from a garden. A simple little flower attached to the side to remind you to stop and smell the flowers. This ring is one of a kind and completely handcrafted by me!